Iris Lovers, This Sale is for you! Logan-Menard-Sangamon Master Gardener volunteers are offering around 200 different iris for sale. All iris are labeled, but do to possible human error, we do not guarantee 100 percent accuracy. Iris rhizomes are $5 per bag. August 28, 29, 30 and 31, from 8:30 to Noon, 1 to 4:30 pm, at U of I Extension office, 700 S. Airport drive, Springfield. Please bring a box to carry your bags. You may bring a friend with you. Where did these iris come from? Kern Acres, an iris farm west of Springfield, was owned by Betty Kern. 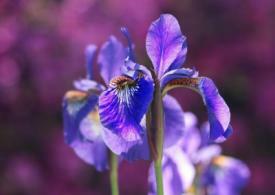 At one time, Betty had more than 300 different iris on about 1 acre of her property. Betty passed away in January 2018. Her daughter, Sandy, shared Betty’s iris estate with us. In the past two weeks, master gardener volunteers have spent more than 200 hours digging, bagging and labeling almost 200 different iris.